Every Christmas my mother-in-law makes Christmas tree decorations with the kids by using little pins to add sequins and ribbon to polystyrene balls of varied sizes. Admittedly the kids often lose interest about half way through (as the balls are too big and the sequins so small) and Grandma or I end up finishing them off, but they do enjoy the process and it is simple for even the youngest of crafters to have fun with (although I probably wouldn’t attempt with kids under 3 years of age). When I spotted these polystyrene eggs at Spotlight my mind went straight to those Christmas decorations and I wondered if we could do the same thing for Easter decorations. A few steps further in the store and I came across some neon sequins (just for fun) and when looking for pins discovered that there is such a thing as sequin pins which are perfect as they are much shorter than your usual sewing pin and are therefore not going to poke through the other side of your eggs! 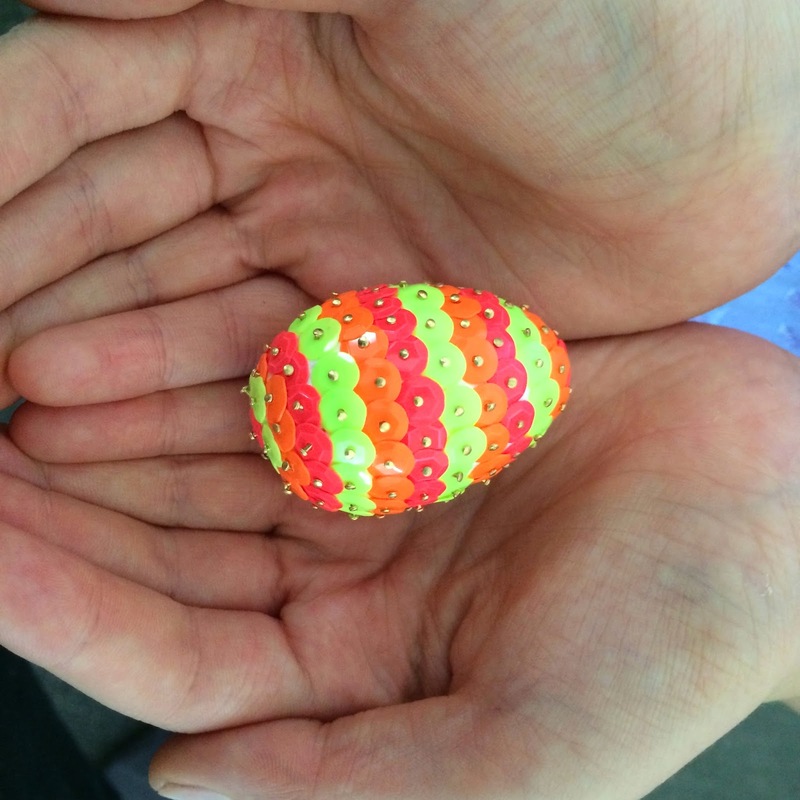 The eggs are pretty small so the kiddos didn’t lose interest and they looked great whether placed in a pattern or randomly spread. These would look cute in a little bowl or you could hang them by adding some ribbon folded in half and attached by a pin to the top of the egg. This post is part of an Easter series here on Frog Goose and Bear. School holidays started here in Victoria yesterday and I plan to do LOTS of Easter crafting so come on back for a visit for more over the coming fortnight! 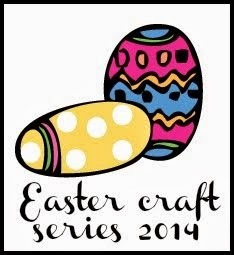 Just click on the pic below for lots more Easter themed crafts, recipes and activities. 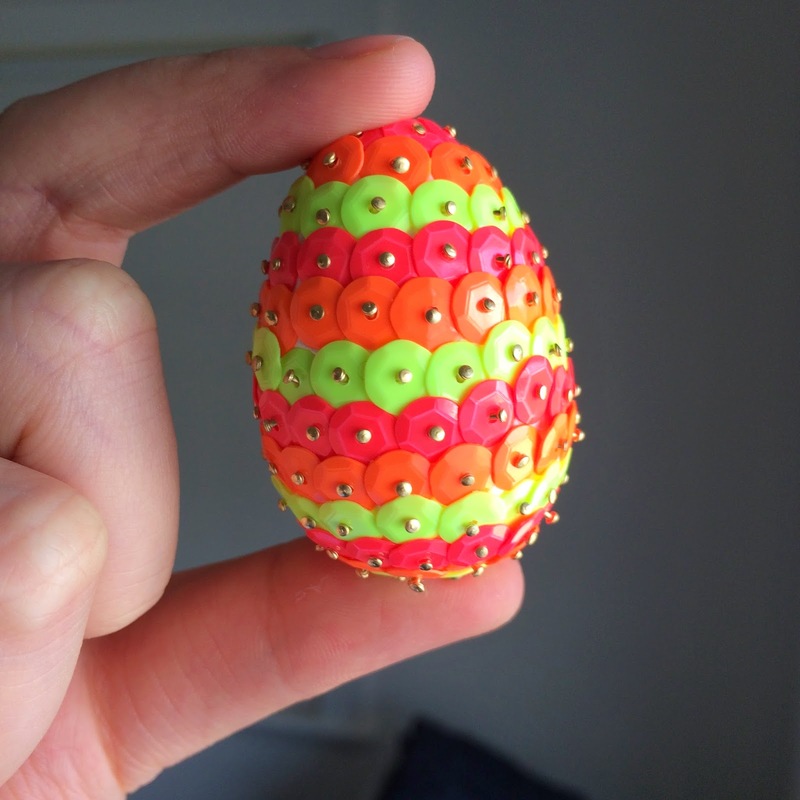 Have you been getting your Easter craft on? If you’re up for sharing – I’d love to see pics of what you get up to! In other news, this Wednesday I am lucky enough to be able to help out at The School’s Kids Holiday Club with the clever Ms Candy Sparkles and fifteen 5-12 year olds at the Abbotsford convent where we are going to make sparkly terrariums and amazing dream creatures. There are still spaces for the Tuesday and Thursday full day workshops – see here for details if you think your kids would LOVE it. I think they totally would!